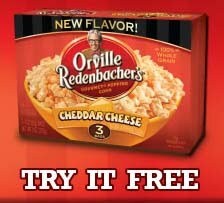 Get a free sample of Orville Redenbacher’s Cheddar Cheese Gourmet Popping Corn from Kroger. Thanks goes to Deal Wise Mommy for the new sample! This free sample is offered at all of the Kroger Family of Stores, so just look below for your grocery store or state to find the right link to request this sample. You do not have to enter your store loyalty card number in order to receive this sample (it is optional). You can only request one sample per household. Try Jolly Time Popcorn it is so much better. I'm so happy!! I love Orville, he is from Valparaiso, IN ..45 min from me and we always support his amazing popcorn. Thanks for the freebie! Looks like you can only request one if your state has Kroger stores. I tried and it doesn't have an option to select FL when you input your mailing address.